Jared Craig received a Juris Doctor from the University of Saskatchewan with great distinction. He articled under the Chief Justice of Saskatchewan the Court of Appeal and has been called to the bar in Alberta and Saskatchewan. Mr Craig is also PhD student at the University of Calgary. His research in the field of biomedical ethics focuses on criminal psychopathy, neuroscience, and brain intervention technologies. 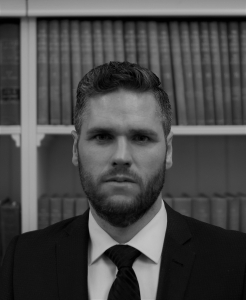 Specifically, his research relates to the implications of novel advancements in neuroscience in relation to criminal law and procedure. In his field, he has lectured at the University of Calgary, presented at international conferences, and published numerous academic journals in the fields of neuroscience, criminal procedure, and human rights. Mr Craig has received recognition and awards for his studies in the fields of law and ethics. He was awarded a gold medal for his undergraduate studies, awards in criminal law and evidence, and was a recipient of prestigious national Social Sciences and Humanities Research Council (SHHRC) fellowship. In a recent academic article published in a leading Oxford Journal, Neuroethics, “The Bright Future of Neuroethics” Mr Craig was recognized as a leading scholar in an emerging field. In his academic studies, and in his practice, Mr Craig is a strong and vocal proponent of human rights. He is driven by an unwavering belief in the importance of fearless defence advocacy and access to justice. He is a member of numerous human rights organizations advocating that aim to raise awareness about these issues, and push for reform within our legal institutions. His commitment to these values and particular perspective has driven him to advocate fearlessly for his clients.